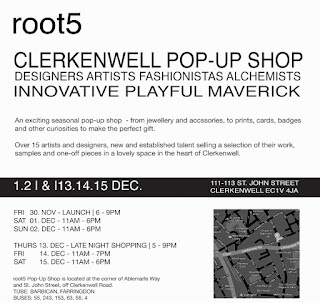 root 5 have opened a pop-up shop in Clerkenwell to run from 1st - 2nd and then 13th - 15th December. Expect cards, jewellery, accessories, badges & curiosities. 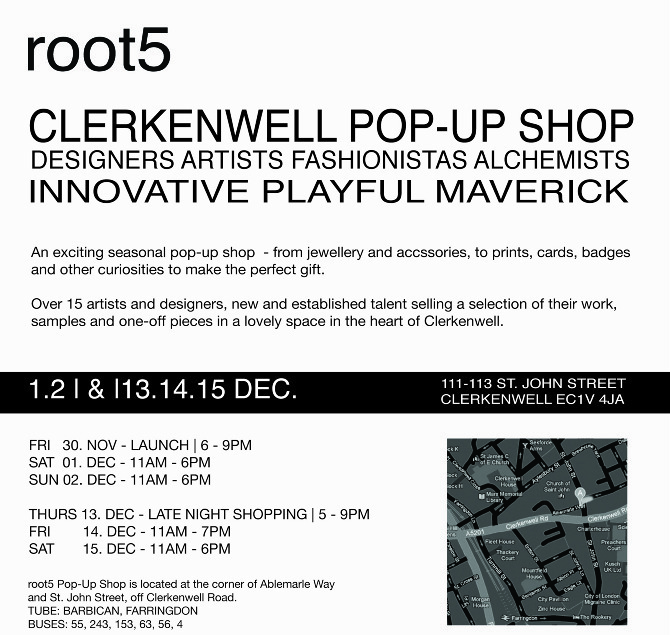 "root5 are excited to present their seasonal pop-up store, showcasing new and old work from established talent and recent graduates, in a new exhibition space right in the heart of Clerkenwell. Established in 2011 by East End artists and designer Sian Evans and Jenny Parker, root5 has invited over 15 designers and artists that represent generations of students and graduates from among others Central Saint Martins and the Royal College of Art. From a selection of the Hannah Martin SHOW collection, the debut collection by Coops London and the all new Hattie Rickards Jewellery Baguette Rings, to the adventures of The Flying Fish Commando, and the prints by Fabric Lenny this is an extraordinary pop-up shop. Items start priced at £2.50, up to the extra-special something, the shop opens with a launch party on 30th November and there will run a small programme of activities and events; come and join us. Sian Evans – Jenny Parker – Hollie Paxton – Sofie Boons – Pip Jolley – Frieda Munro - The Flying Fish Commando – Yuko Hotta – Hannah Martin – Hattie Rickards – Coops London - Holly Barton – Fabric Lenny – Mungo Gurney – Fern Jelleyman – Shelf - Bella Mung – Benita Gitake – Maja Rohl"